On those hot summer days, we don’t want a little heat to get in the way of our exercise regime, whether for training or just for keeping fit. One of the best ways of keeping cool while on your exercise bike is using a fan. But which fan should you get? There are a few different types of fans to choose from and while the final outcome (to cool you) might be the same, the different fans offer different solutions and different considerations. In this article, we run through how each fan can help and things you may need to consider when purchasing that fan. Hopefully, this will help make your buying decision easier. This floor fan is a powerful fan, that is easily portable and will cover your whole body with air. The negatives of floor fans are that they do not oscillate and do not have remote controls. You would need to get a smart plug to be able to change settings on the fly. This fan can be mounted and is a great choice if you prefer to have a two fan setup close to you. The fan is small and won’t have the airflow of the bigger fans but can be put it closer proximity. You can purchase a remote control for these fans. 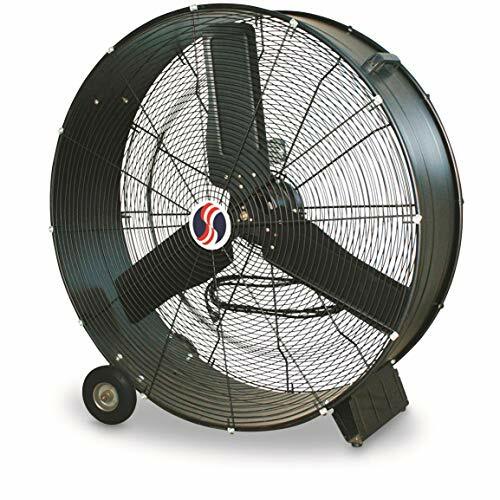 Pedestal fans are a great option as they have a lot of flexibility with remote controls, features and fan direction, while also having the ability to provide decent cooling. 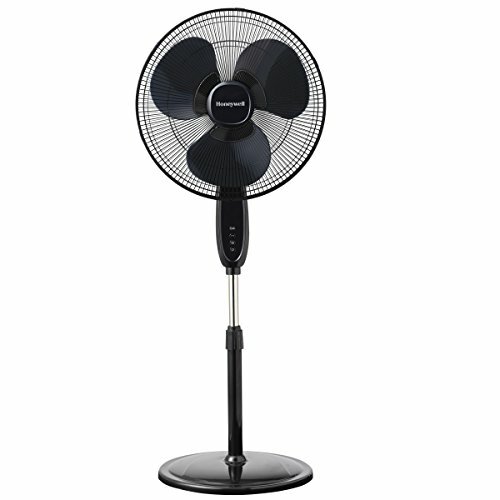 You can also pick up pedestal fans at pretty reasonable prices. The Honeywell Double Blade is a very solid, cheaper option but you can pick up a Rowenta pedestal fan which we think is the best pedestal fan. A drum fan is likely to be overkill but if you want something really powerful that will blast your whole body with air a drum fan will certainly do that. You will, however, not have many features and convenience as they don’t tend to have remote controls, and you cannot adjust height or oscillation. As far as drum fans go though, the Q standard is a popular and durable option. This utility fan moves just a little less air than a floor fan but we have mentioned this fan in this article as a number of people have used this fan for their indoor cycling cooling needs. It does have an advantage of 2 power outlets but is a bit more expensive than your typical floor fan. This unit is, however, highly regarded and a very good, highly rated fan. If you are running short on floor space but still want to have a powerful option, a wall mounted fan could be a good choice for your cooling needs. This particular fan is more powerful than your blower fan at around 1150 CFM and provides a durable, long-lasting cooling option. Why Do I need an Indoor Cycling Fan? Exercising in a climate-regulated space means a much safer and more effective exercise. Without a proper cooling system, your body is likely to overheat and it will start signaling that it’s tired. You may start feeling nausea, dizziness, headaches, and muscle cramps. This is simply why keeping your body cool during your routine will help you achieve significantly better results. What a cooling fan does is pretty simple, as your body starts to heat up, the stream of air from the fan will evaporate the sweat you produce, helping to keep your core temperature at an appropriate level. Regulating your temperature with a fan will also relieve the extra stress on your body. 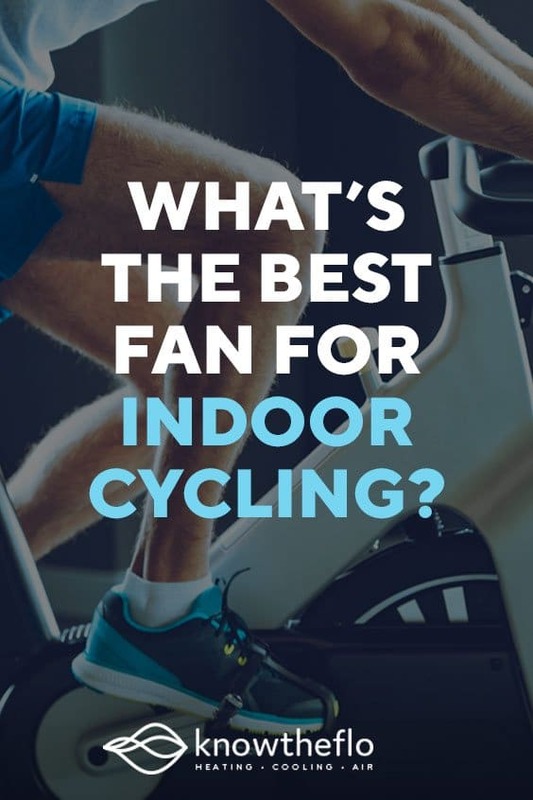 How Do I Choose an Indoor Cycling Fan? Luckily, fans come in a wide variety and there’s a fan for every budget. Choosing the right fan boils down to your own needs but consider the following elements to make the best purchase. Along with the most important decision of which kind of fan is the better choice (we will get to this shortly) below are a few things to consider when purchasing. It’s a measure of the fan airflow that indicates how much air a fan can move per minute. The greater the CFM, the more air the fan will move around. That’s how far the air coming out the fan can go. If you have a large space, you’ll need a fan with long-range air circulation. Examine your workout space to decide whether you want a fan that sweeps airflow around the room or if you’re better off with a fan that focuses air in one direction. For instance, if you train with a partner and only have space for one fan, then, in that case, an oscillating fan is a more reasonable choice than a fixed one. Bigger doesn’t necessarily mean better! An overly large fan may not direct air in a targeted manner as well as a smaller more flexible fan might. They will, however, provide far more airflow, so this will come down to your preference. This may or may not be of concern to you while cycling indoors, but if you do not plan on wearing headphones, be sure to read reviews on how loud the fan you are looking at is. Also be aware that the larger and more CFM a fan has, the louder it is more likely to be. Over time, fan blades collect dust and grime that need to be cleaned. Consider a fan that is easy to clean to save your time and effort. Fan manuals should have cleaning instructions, so make sure you check them before purchasing the fan. Adjustable speed allows you to control the temperature of your workout space. More speed settings in a fan mean that you don’t have to compromise feeling too hot or too cold. Pedestal fans tend to have far more range and settings than the other fans listed here. This could be a big one depending on how you like your setup. If you like to be comfortable all the way through your ride then the ability to change settings on your fan may be of importance to you. The thing to remember when buying a fan is that not all fans come with a remote control. It is not such a big deal as you can always purchase a smart plug and control your fans that way, but it will just mean an extra cost will be involved. How Do I Set Up My Fan? This again will come down to personal preference. There are people that run a couple of smaller fans just in front of their bike preferring to have the fans nice and close, and easily adjustable from where you are. Some prefer to have one or two pedestal fans parked over to the side. 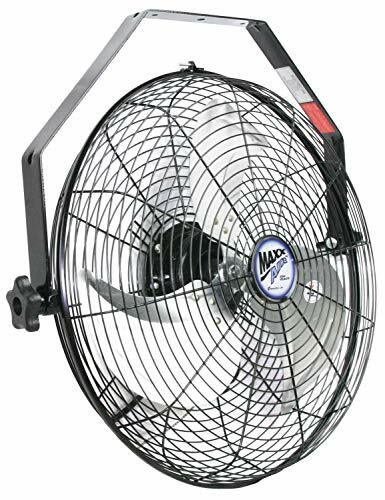 These fans are useful as you can adjust their height and direction to suit you as well as have them oscillate. Many also offer a variety of “breeze” settings, to simulate the “natural environment”. With two of these fans set up to the side, you can direct them to each side of your body and target where the skin is most exposed to ensure the best cooling. Then you can get some larger fans such as a floor fan which will just blast a whole lot of air your way. If that’s not enough or you have a large space you could even go a drum fan, however, these are likely to be overkill and be more like riding in a strong wind! Below is a video of a reasonable setup. The guy makes some good points about the placement of fans for maximum cooling. In the next section, we’ve collected and reviewed our favorite fans for indoor cycling. Let’s get started! 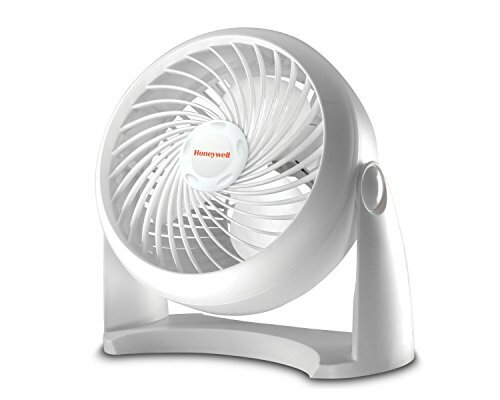 The Honeywell HT-904 fan is a tabletop, versatile, small sized fan that is very light-weight at only 2.6 pounds. This makes it easy to move around the room. At 350 CFM, this fan will be satisfying if your workout room is small or medium-sized. If you have little space available, you can mount this fan on a wall. It’s a powerful fan compared to other models of the same size and category and it’s a superb option if you’re on a tight budget considering its affordable price. It features 3-speed levels and an adjustable head that pivots and reaches at a 90-degree angle allowing for direct cooling. This fan doesn’t come with a remote controller, but you can buy a separate remote switch. It comes with a fused safety plug and 1-year warranty. This little jewel does what it should, however, it’s not the quietest fan out there. The fan comes already assembled and is designed with a removable grille to make cleaning easier. Once you remove the grill, wipe the fan clean or remove dust using a vacuum cleaner or a dust wand. When it comes to pedestal fans, the Honeywell Double Blade is our favorite. It’s a powerful, neat-looking stand fan that comes with a double blade design, meaning you’ll get more air volume and better cooling. It’s an option worth considering if you’ll be using it in a large room because its oscillation range is quite wide. The stand of the fan can also be adjusted to a height of 48 inches and its head tilts allowing to direct air in the area you prefer. This Honeywell fan is a 3-speed fan and has a variety of airflow types (normal, natural and quiet). This fan comes with a 1-8 hour auto-off timer, LED controls and a remote controller, so you won’t have to invest in buying one and you can simply adjust speed and air type without having to interrupt your workout. It’s considered quiet when it’s set on the low-speed setting, but it gives a little buzz as you increase the speed level. Cleaning this fan is pretty simple. All you have to do is remove the grille and clean the blades with a damp cloth or a dust-feather. You’ll have to assemble this fan yourself, but doing so only takes around 10 minutes. 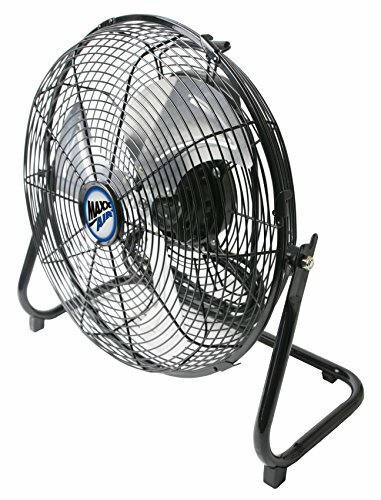 Despite its compact size, the MaxxAir 14’ Fan is powerful and sturdy! This fan could be the one for you if you don’t have much space available and you don’t want to compromise on quality. It comes with 3-speed levels that you can control through a dial switch found at the back of the fan. Also, the adjustable head tilts for customized air-flow. A fantastic thing about this fan is the non-skid feet that ensure that the fan stays in place even at its highest setting and it’s almost impossible to knock over (you surely don’t want a fan that drifts around the room!). It’s designed with handles for easy transport, so it’s great if you want to use it in other rooms too. Additionally, the fan has a built-in cord wrap for easy storage and also comes with a 1-year limited warranty. This fan is certainly quiet on low and medium speed setting. On the high setting, we’d say it makes a smooth sound rather than noise. It can be easily taken apart with no tools for easy cleaning and comes already assembled. The Q Standard drum fan isn’t exactly the best-looking fan out there, but we can’t argue that it’s a powerful, heavy duty fan that goes a long way! It’s a direct drive fan, and with that said, it saves tons of energy and requires minimum maintenance. With 2-speed levels and 9100 CFM, it’s an undeniably strong fan that pushes a lot of air for the power it consumes. The Q Standard fan is a bit costly but if you’re looking for a durable fan, this fan is the one, thanks to its solid steel construction. Although it’s on the heavy side, the rubber wheels and handles of this fan make it easy to move around. If your workout space is large, this fan works great. Like most powerful fans, it’s not very quiet, however, the noise level is acceptable. It comes already assembled, except you only have to attach the wheels which barely takes 5 minutes to do. When it comes to cleaning the fan, just use screws to remove the front cover and wipe the blades with a damp cloth or use a vacuum. 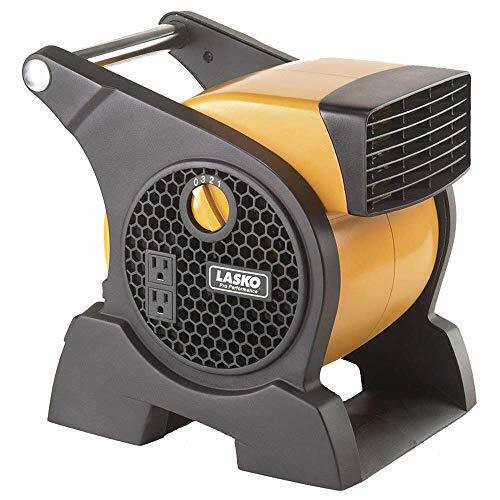 The Lasko Pro-Performance is a squirrel cage fan that is specially designed to be used at times when you need high-velocity air. This fan is exceptionally powerful even at the lowest setting, so it’s a perfect choice for large rooms. It comes in a yellow-black design with 3-speed levels that are manually controlled. The head of the Lasko 4900 pivots, providing a larger range of airflow and its wide base makes it very stable. The fan has a built-in carry handle that would come in handy if you’d like to move the fan around. As an added bonus, the fan comes with 2 12-volt built-in accessory outlets that you can use to charge other electronics, for instance. It’s also sold with a 1-year limited warranty. When it comes to safety, the Lasko 4900 is awesome. It has a safety plug with a circuit breaker in case the current is too high and it’s very safe if you have children or pets because its blades are hidden. The fan motor is very quiet. It only produces a whooshing sound of air. To clean the fan’s interior, you’ll need an air compressor or a vacuum with a brush attached. Got no space on the floor to place your fan? The MaxxAir wall mount fan will get you covered. This powerful steel construction fan gives maximum air circulation. Its steel construction body and rust-resistant grilles make it reliable and durable. You can mount this fan on the ceiling, in a corner or on a wall. The fan head tilts 180-degrees up and down for better air circulation. It comes with 3 different speed levels that you can control with a pull chain. It’s perfect for large spaces, given that its highest speed setting is at 1450 CFM. A great thing about this fan is that its motor is completely enclosed and isolated, so you can literally spray water on this fan without harming it. This fan is not silent, but comparing noise vs. fan power, it’s very acceptable. It comes fully assembled with a heavy duty hanging bar so you can quickly set it up. The fan bracket can be removed for cleaning the blades. Many fans come without a remote controller, which makes you have to get up if you want to turn on your fan after your warm-up for instance. That’s when the TP-LINK Mini Smart Plug jumps in. This smart plug is an awesome, versatile device that allows you to turn on & off your fan (or any other device) remotely, without having to get up. Its small design accommodates wall sockets that have more than one outlet. It’s compatible with 3-prong outlets and features an LED indicator on the side that lets you know if the plug is powered on. The smart plug is extremely easy to use, all you need to do is install the mini smart plug app on your smartphone and follow set-up instructions to connect it to your network. The cool thing about this smart plug is that you can even schedule on and off times, that way your fan can automatically turn-on at the scheduled time without even having to reach for your phone. The TP-LINK smart plug comes with a 2-year limited warranty. We just can’t help but love the Lasko 4900 Pro-Performance High-Velocity Fan! It’s the ultimate fan for indoor cycling that will keep you cool during your workout. With a handful of practical features, the Lasko Pro-Performance fan isn’t just your typical fan. It’s powerful, sturdy and stable. This fan may not be the only powerful fan in our round-up, but it does have many add-ons that make it stand out from the crowd. You don’t have to worry about assembly at all like the Honeywell Pedestal Fan. You can very easily move it around using the built-in handle, unlike the wall-mounted fan models. Not only is the Lasko 4900 an amazing fan when it comes to performance, but also the edgy design and pivoting head are pretty awesome too. Lasko went the extra mile by adding the accessory outlets to this fan and the safety features are perfect for when children and pets are around. It’s considered a budget-friendly fan when compared to other fans in the same category. If there’s one thing we’d like to add to this fan, it would be the remote controller. That isn’t a deal breaker though since you can just install a smart plug and you’re all set!